We love trees and they have huge benefits for our environment and wellbeing, but there are occasions when they just have to be felled. Give the qualified experts at Horsham Tree Surgeons a call and we'll take care of all your tree felling jobs. There are many reasons why trees sometimes have to be removed, however sad it may be. Sometimes a tree is diseased and could pose a danger to you, your family or passers-by. 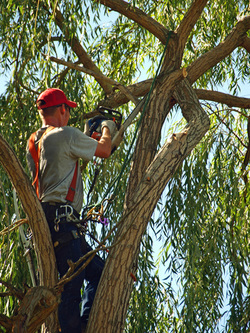 We can assess your trees to see whether they need to be removed or can be saved. If felling a diseased tree is the only solution, we will cut down and remove the tree for you, leaving your garden neat and tidy. We will also remove the stump if required. There are times when buildings have been erected too close to trees. Usually the trees were there first, but they may have been small when the decision was made to build so close. Over the years the roots of trees can destablise buildings until there is no option but to remove the tree. Or it may be that trees were inappropriately planted. Unfortunately we often see this with Leyland Cypress trees, which can grow to enormous heights, frequently blocking out light and casting huge shadows over a number of gardens. Use our tree cutting service to fell your Leylandii trees or let us cut them drastically to remove your headaches! Or some of your trees may just be ancient, well past their best and better taken out. Some fruit trees will go on for many years, but eventually they start dying and are better replaced. 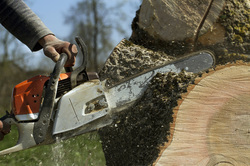 Of course Horsham Tree Surgeons are ready and willing to help any time you need trees felled.